Straight talk about professional success from America's smartest headhunters and career management minds! Whether your concerns are resumes, job search, turning interviews into offers, job security, climbing the ladder of success, choosing or changing careers, pursuing your dreams, or owning your own business, here's an integrated blueprint for success. 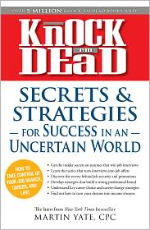 With Knock 'em Dead: Secrets & Strategies, you have everything you need to take control of your job search, career, and life. Lots of books tell you to pursue your dreams; this one tells you exactly how to make it happen.